Am I the only one who didn’t know that “faux roman shades” were a thing?! I had no idea they existed, but there’s an entire community of faux shade makers on Etsy, and I’m here today to prove that it’s a community worth tapping into. You see, our kitchen window has always been a bit of an eye-sore. In fact, the entire room is a bit hard on the eyes. Not because of the aesthetics—in fact, it’s one of my favorite rooms in the house! It’s a little unpleasant to be in purely because of the light, or lack thereof. Let me back up a little bit to explain. The one window in the space looks into our carport, so we only ever see secondhand, indirect sunlight through it. 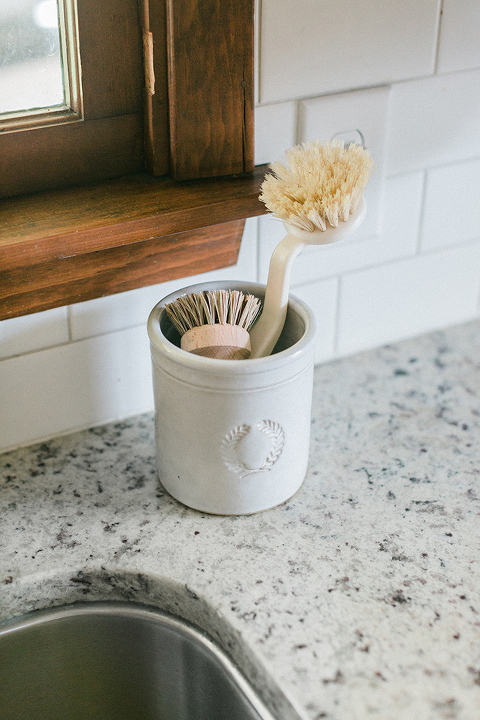 If you couldn’t already tell from the less-than-stellar photos in this blog post, natural light is scant at best in the kitchen, so I’m always brainstorming ways to maximize it. I’d love to put in a skylight, but John’s very against them (something about a leaky one in the house where he grew up), so instead I’ve put all my energy into making that single window pull double duty. When we first moved into the house, the kitchen window was covered, not only by bifold shutters that took up half the window, but also a little sheer curtain swagged from above. It obstructed most of the light, so I took everything down right away. Then, I hung two drapery panels in their place to fall on either side of the window. They were purely decorative because we never need to close the curtains (the shade of the carport provides plenty of privacy), but over time those panels got messy from water and whatever else splashed on them from the kitchen sink. Enter: my search online for “faux roman shades.” I wanted something pretty to highlight the window, but it didn’t really need to be functional for privacy. The goal was something slightly colorful with a hint of pattern, and something that I could hang up high out of the line of fire from the kitchen sink. And that, my friends, is when I stumbled upon the floral faux roman shade you see pictured above. You might recognize the fabric from the upholstered cornice board that used to be in our bedroom. As soon as I saw that familiar pattern on Etsy, I knew the shade needed to be mine. The shop I purchased it from allows for totally customizable shades, so I was able to match the width of the new shade precisely to the width of the window. Looking at these photos now, I wish I had ironed the shade before hanging it, but I was just too excited to wait. It look hardly any time at all to hang, too. All I had to do was take the old panels down and slide the new shade over the tension rod. We’re talking less than five minutes! 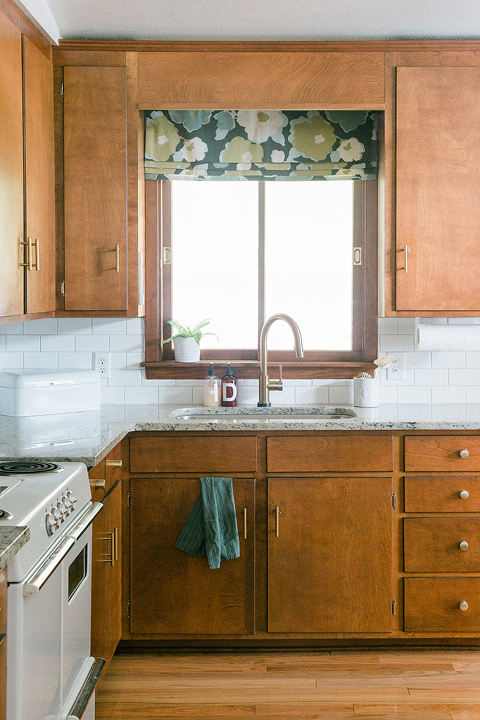 I love that the new fabric has just enough color in it to bring some life to our dark kitchen, plus I think the oversized floral pattern feels a little retro, so it suits our mid-century kitchen really well. The real thing I love most about the shade, though, is the fact that it barely blocks any natural light. 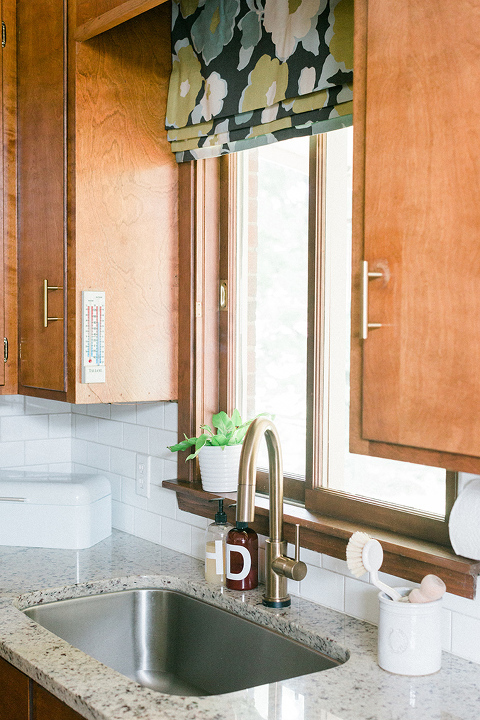 You can see the drapery panels I mentioned before in this photo tour of our kitchen from 2016. They were nice looking, but they blocked a good bit of that precious light. The new roman shade only covers a couple inches of the window at the very top, which I’m actually grateful for because (as you can see in the photo just above) it hides our security camera from sight while we’re working in the kitchen. So, what do you think of the update? Do you like the extra dose of pattern and color? 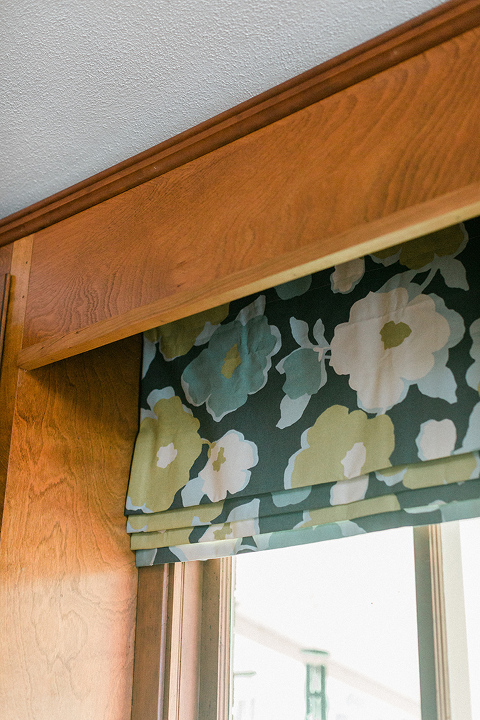 Did you know that faux roman shades were a thing? This post isn’t sponsored and I paid full price for my shade, but I’d do it all over again if I could. The Etsy shop owner I ordered from was really easy to communicate with, and did a beautiful job on our custom treatment—I couldn’t recommend her more. Now I’ve got to go take care of those wrinkles…Have a great Monday, everyone!